My love for the new Cali beads continues. All you need are Cali beads and 11/0 seed beads to make this simple band that has got a bit of dimension to it. Although you can make it flat by adding more seed beads or some bigger beads, I love the hilltops. *Cali beads are new Czech 3x8mm marquise-shaped beads with three holes! Step 1: Thread your needle with about 4 yards of FireLine (or start with a length that you feel comfortable working with and add more later). 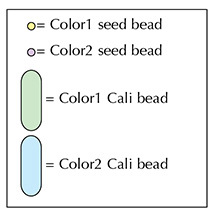 Leaving about a 10-inch tail for attaching a clasp, string a Color2 Cali bead, a Color1 seed bead, a Color1 Cali bead, a Color1 seed bead, a Color2 Cali bead, Color1 seed bead, a Color1 Cali bead and Color1 seed bead. Step 5: Now you will add a middle ring of seed beads between the middle holes of the Cali beads. Pull tight and as you do, the motif will begin to dome slightly and form a hill, of sorts. Step 11: Now you will add an outer ring of seed beads between the outer holes of the Cali beads. You’ve just finished the first motif. Now you will repeat Steps 16-35 to add more Hilltop motifs. When your band is the length you want it, you will add Color2 seed beads in between the motifs to stabilized the “hills” and keep them from flopping around. Step 17: String two Color2 seed beads, a Color1 seed bead, a Color1 Cali bead, a Color1 seed bead and two Color2 seed beads. Step 21: String a Color1 seed bead, a Color2 Cali bead, a Color1 seed bead, a Color1 Cali bead, a Color1 seed bead, a Color2 Cali bead and a Color1 seed bead. Now you will add a middle ring of seed beads between the middle holes of the Cali beads. Pull tight and as you do, the motif will begin to dome slightly and form another hill. Step 29: Go around and across through the bottom hole of the same Color1 Cali bead that you exited at the end of the last step (highlighted in RED). Now you will add an outer ring of seed beads between the outer holes of the Cali beads. You’ve just finished the second motif. In the following steps, you will add Color2 seed beads in between the motifs to stabilized the “hills” and keep them from flopping around. Step 42: String three seed beads. Go through your clasp and then back down through the last seed bead that you just strung. Use your extra tail thread to go back through the beads along the outer edges. Knot in several places and then cut your thread. To attach the clasp to the other end of your band, thread your needle with the tail thread from Step 1. Repeat Step 41 to 43.